Figure 1: Posterior leaflet quadrangular resection, annular plication. Posterior leaflet prolapse due to fibroelastic deficiency is most commonly treated by a resection of the prolapsed segment affected by chordal rupture (Figure 1). The prolapsed segment is removed by excising a quadrangular portion of the leaflet. The posterior annulus is then vertically plicated by placing and tying several sutures in the resected area. 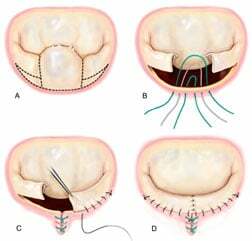 Direct suturing of the leaflet remnants restores posterior leaflet continuity. In cases of fibroelastic deficiency where adjacent tissue segments are thin and normal, it may be preferable to re-establish support of the margin of the leaflet without performing a formal resection. Figure 2: Posterior leaflet quadrangular resection, sliding plasty. In the case of Barlow’s disease, excessive posterior leaflet tissue is present, and it is necessary to reduce the height of the posterior leaflet to avoid post-operative systolic anterior motion (SAM) with resultant left ventricular outflow tract obstruction1. Following resection of the prolapsing segment, a sliding leaflet technique is performed to shorten the height of remaining leaflet segments (Figure 2). The residual segments are detached from the annulus and excess tissue removed from their base; compression sutures are then placed in the posterior segment of the annulus. A “sliding plasty” of the residual segments is performed and the gap between the residual leaflets is closed with sutures. 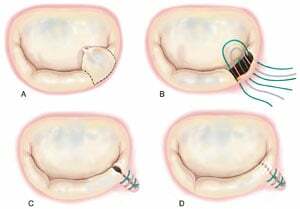 * Modified from Carpentier A, Adams DH, Filsoufi F. Carpentier’s Reconstructive Valve Surgery. From Valve Analysis to Valve Reconstruction. 2010 Saunders Elsevier.